Functional test of Japanese caseless gun, automatic. 40 mm, HO-301. 1947. Gun given preliminary examination: then 56 rounds were fired, during which rate of fire, instrumental velocity, target dispersion, fuze function, and amount of breech and muzzle flash were observed. Aircraft gun which resembles Oerlikon a/a 20 mm guns. Photographs. For free shell-guns. (In Flight, Apr. 14, 1938, p. 309) An Oerlikon aircraft mounting with electrical drive. (FFS model) Illustrated. Handbook of the gun, machine, Polstcn, 20 mm Mk I, 6 Mav 1944. Primarily an anti-aircraft weapon against low flying aircraft. Description and action are given. Similar in principle to 20 mm Oerlikon used by Royal Navy. Drawings and diagrams. Modern shell guns. (In Flight, May 2, 1940, p. 406) Describes the Oerlikon series for aircraft, anti-aircraft and infantry use. Drawings & technical data. The Oerlikon cannon. (In Flight, Jul 22, 1937, p. 2) Facts and data on this weapon. Data and description of weapon. Illustrated. The Oerlikon 20 mm revolver gun 206 RK. Ashcville, N. C., n. d.
Description of high performance aircraft gun "featuring a high muzzle velocity and an exceptionally high rate of fire. ' Contains description, operation, parts list, etc. Diagrams, photos of weapon and components. The Oerlikon 30 mm revolver gun 302 RK. Asheville, N. C., n. d.
Technical data, principles of operation, installation, ammunition, description of components and service instructions are given. Photographs and diagrams. The "Oerlikon" 20 mm automatic gun, type 5 TG. Zurich, n. d.
New weapon with rate of fire of 1000 r. p. m. and an initial velocity of 1130 m./scc, tripling performance of conventional 20 mm guns. Contains technical data, description, photos and diagrams. The 20 mm aircraft armament "Oerlikon". Oerlikon, Switzerland, 1936. 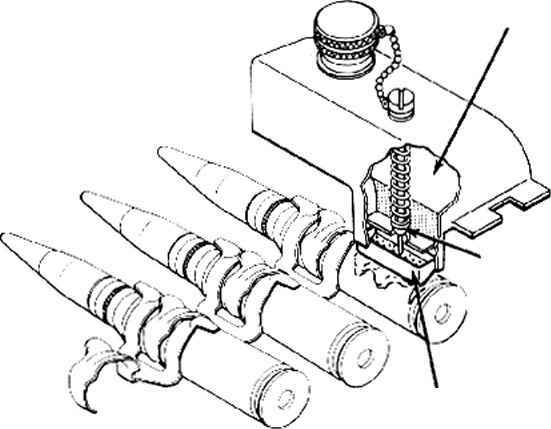 Descriptions of Oerlikon guns, models F, L, S, with illustrations, types of mountings, sighting devices, ammunition, etc. Notice technique du canon type 9. 1937. (In French) Relates to mounting and upkeep of engine mounted 20-mm cannon. Illustrated. History of 20 mm A. A. gun and mount program. 7 Nov 1 945. Story of negotiations for and production of Oerlikon 20 mm a/a guns by Navy in WW II. Describes construction, operation and maintenance of the 20 mm A A guns. (Oerlikon) Plates and diagrams. "Semag" 2 cm machine gun. 14 Apr 1923. Description, characteristics and photographs of Swiss-made gun, based on Becker cannon. Tabulated comparison of data with those of 20 mm Oerlikon and Hispano-Suiza. Data on F. F. aircraft gun (Oerlikon) preferably used as fixed gun. U. S. Naval Powder Factory, Indian Head, Md. Gun, aircraft cannon. 20 mm, fixed, type 99, Mk I, with magazine—Japanese. 8 Nov 1945. Preliminary descriptive report with photo. Jap version of Oerlikon cannon. Gun, machine, cannon, aircraft, 20 mm, tvpe 99, Mk II Mod IV—Japanese. 26 Nov 1945. Description (brief) and photo. Oerlikon type.